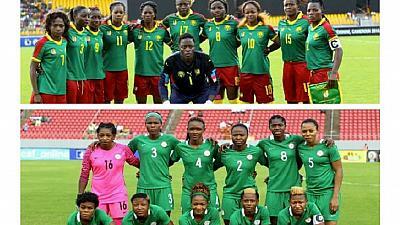 The outcome of Saturday’s women’s AFCON final between hosts Cameroon and defending champions Nigeria will most certainly set the tone for next year’s 2018 World Cup double header between both countries. Nigeria and Cameroon were lumped into the so-called African qualifying series ’Group of Death’, alongside Algeria and Zambia, when the draw was made for the big race to Russia. However, the Super Eagles now have a vice grip on the pool after winning their first two matches of the series, and are four points clear of second–placed Cameroon, who have just two points. The next two matchdays, which will pit the Eagles and the Lions against themselves in Uyo and Limbe, are seen as capable of determining the team that will come out of that pool to represent Africa. A win in both matches will catapult the Eagles to the World Cup, with only the minimum to do in their remaining two matches. Conversely, victory in both games will renew Cameroon’s hopes of a seventh FIFA World Cup finals appearance. Another consideration for the Super Falcons however, is the pinfall handed the Super Eagles 16 years ago by the Lions, in front of home fans during the final of the 2000 Africa Cup of Nations competition. On the eve of St. Valentine’s Day in 2000, the Lions showed no love to a packed National Stadium in Lagos as they raced to a 2-0 lead with goals from Samuel Eto’o Fils and Patrick Mboma. Chukwu Ndukwe reduced the tally just before half-time and ‘Jay Jay’ Okocha slammed in a long-range equaliser just after the restart, but Nigeria lost following a dramatic penalty shoot-out, in which Tunisian referee Mourad Daami ruled Victor Ikpeba’s kick that bounced behind goalkeeper Alioum Boukar a no-goal. Saturday is an opportunity for pay –back, even though these are the women. The Falcons are unlikely to forget that the Lions also beat the Super Eagles in the Cup of Nations final of 1984 and 1988, and stopped Nigeria from going to the 1990 FIFA World Cup after winning 1-0 in Yaounde when the Eagles needed a draw. The Lionesses themselves will recall how the Falcons badgered them to a 2-0 defeat in Windhoek in the final of the last edition, and how the Eagles bundled then Cup holders Cameroon out at the quarter final stage of the 2004 Cup of Nations in Tunisia. The Falcons are yet to lose a Cup of Nations final match, winning in 1998, 2000, 2002, 2004, 2006, 2010 and 2014.